Build Your Own Soda Blaster Cheap! Cleaning and rebuilding your carbs can be difficult these days. The really good cleaners of yester-year are no longer available now that they have been deemed "bad for the environment" and outlawed. The cleaners we could always count on are now effectively rendered almost useless. Ah yes, I remember being able to buy a gallon can of carb-dip at the local parts store and it would strip decades of grime away over night with one 12 hour soaking. Now the same brand barely loosens varnish let alone cleans it away with days of soak time. . . You still need to get carbs clean, but chemicals today just can't do it alone and you don't want to spend an afternoon scrubbing all the nooks and crannies of your carb housings. What's a guy (or gal) to do?? NOTE: As far as air compressors are concerned for blasting, the bigger then better. The more CFM it flows the better the results will be. If you try and blast with a tiny 2 gallon compressor, you will be disappointed. For best results use a compressor with at least a 25 gallon tank that flows at least 6 - 7 CFM. I personally use a 60 gallon, 5hp, upright, Ingersol Rand and get fantastic results. Again, the bigger compressor the better. 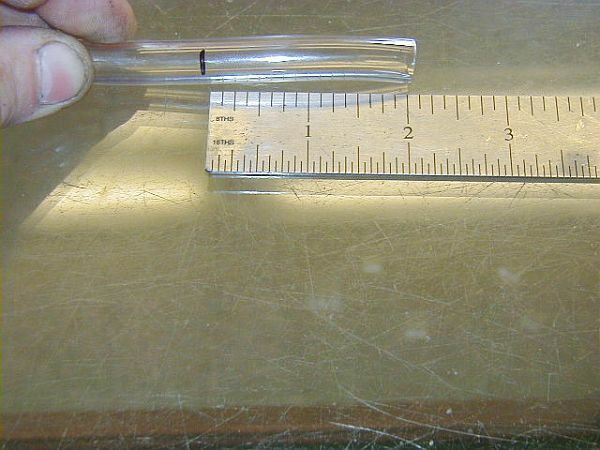 You start by cutting your length of vinyl hose approximately 2-2.5 feet long. Vinyl hose is available at home stores like Home Depot, Lowes, etc. for around $2.00 for a 10 foot roll. Then measure from one end in about 2" and mark it with a Sharpie. Take your knife or razor blade and make a small cut across the hose ONLY through one side. The cut needs to be just large enough so that the tip of the air wand attachment will stick into the hose. 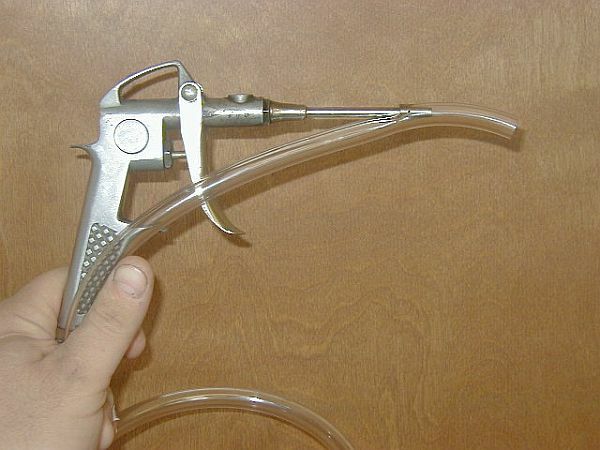 Stick the tip of the air wand into the hose and let it stick in about 1/4" - 1/2". 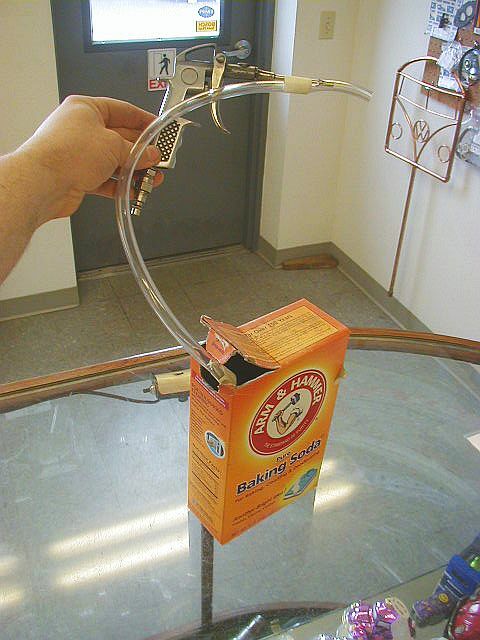 Positioning your wand tip like this will create a venturi effect in the hose causing the soda to be pulled up from the box by low pressure and mixed with the high pressure air from the wand. Use one length of tape to wrap around the end of the air wand and hose. This will keep the hose in the proper position on the wand tip during blasting. 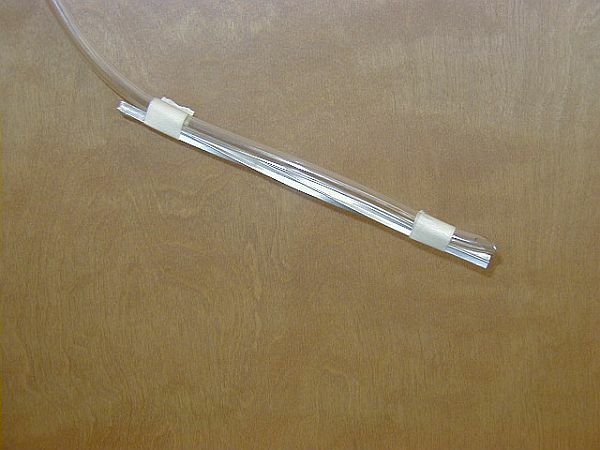 I cut the other end of the vinyl hose at a 45 degree angle to allow better flow of the soda into the hose. Then I tape the piece of dowel, metal rod or wire to the other end of the hose. This will help keep it from curling up in the box of soda and help you keep good flow into the hose. You will need to periodically shake the box to keep the soda flowing nicely. 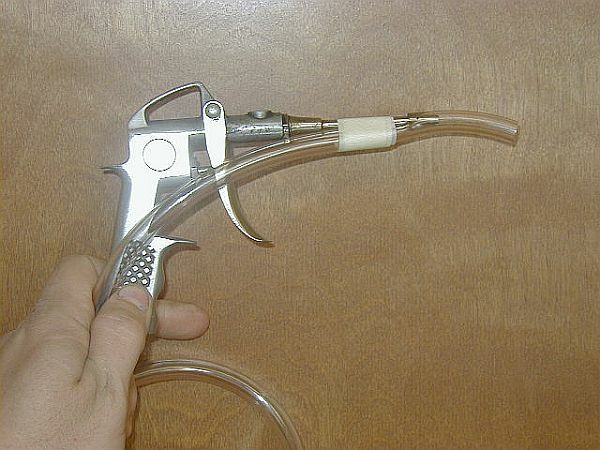 Now you have your ultra low-tech & cheap soda blaster ready for blasting!! WARNING: Blasting should ONLY be done outside in a well ventilated area such as a patio or concrete driveway. Of course proper eye protection and a face mask should always be worn. Baking soda is not poisonous but it feels like your breathing a soft drink if you inhale it and it's irritating, so protect those lungs!! 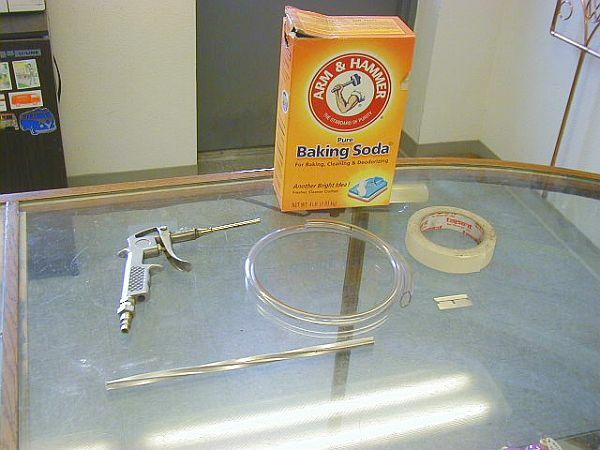 Baking soda will get all over you and the surrounding area, but don't worry, it won't harm anything. Just wear some cloths you don't need to wear for a hot date later because they will be coated white when you're done. Adjust your air pressure to about 80 - 90 psi on your compressor. 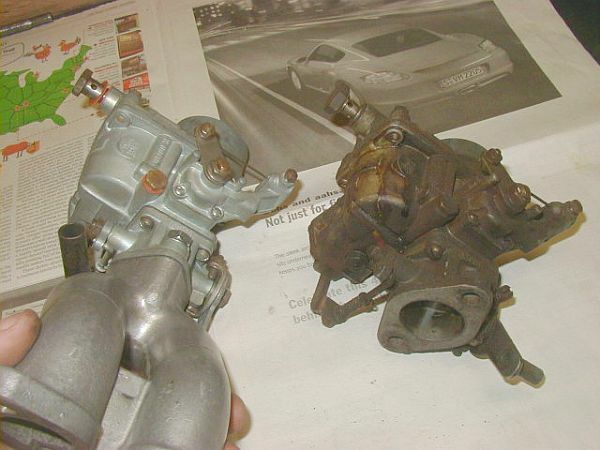 You only need to hold the blaster tip about 6" or so from your carb parts and begin the blasting. Soda is a soft media and will not harm the factory finish of your carbs. It removes all organic matter from the carb bodies as well as heavy corrosion scale in aluminum. It will not remove rust or corrosion from steel hardware; it only removes the scale build-up. You can freely blast into passages and the carb bowls since soda dissolves with water!! Once you are finished blasting, simply place all your parts into a pot of warm tap water. The soda will dissolve into the water and leave NO RESIDUE behind. Then blow out the passages with air just as you normally would and your carbs are ready for re-assembly. The mess on the concrete cleans up just as easy. Simply spray it down with the garden hose to dissolve the soda. NO caustic chemicals to seep into the ground water for future generations to deal with; this is a real "green" solution to carb cleaning and it's inexpensive too. 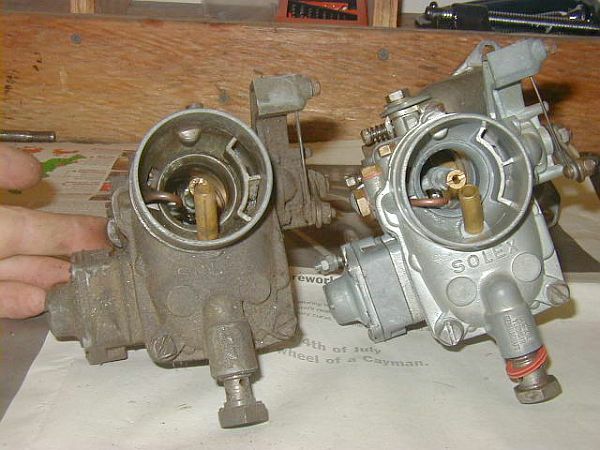 Below are a few before and after photos of some rare Porsche 356 carbs that I cleaned with this exact low-tech blaster. The results speak for themselves. Total cost for this blaster is about $5 including the box of soda!! So the next time you need your carbs cleaned, give this AircooledTech; Tools-on-the-cheap soda blaster a try and see what you think. I'll bet you never go back to chemical carb cleaners again! !